On can regard the Minkowski diagram as a table consisting of cells neatly ordered in rows and columns. In fig.3 (see below) one can distinguish the horizontal rows and vertical columns of the laboratory frame. One can also distinguish the oblique rows and leaning columns of the rocket frame. An event marks a point in spacetime, approximated by the cell it is in. Two events that coincide will keep coinciding no matter in what frame observed. Two events in the same cell that are divided by a small space or time very well may reside in different cells when observed in a different frame. One cell represent a point in spacetime. In fact it is not a point but a one-moment slice of space perpendicular to the rocket’s velocity. You have by example the slice the laboratory L is in. The appropriate column then is the history of that slice. The laboratory experiences one moment of its system of rods and clocks at the time. They call it the “now” and now they experience the whole system of rods and clocks passing to the next moment. In fig.3 one horizontal row is clearly one moment of laboratory space, one moment of the earth’s system of rods and clocks. laboratory x-coordinate (the position of the cell in the laboratory-frame). Rocket frame position x’, the fourth number, was left out again. The 3 numbers in a particular cell are undividedly attached to each other as the numbers of one domino stone, no matter in what frame observed. One very well may consider the surface of a cell of spacetime to be the domino stone’s surface. For the moment the dominoes maintain relative position precisely like the cells they replace in the Minkowski diagram of laboratory spacetime. The surface of the table is the structure of spacetime. Unfortunately the laboratory M turned out to fall just in between two domino’s. The assistants at L could divide any cell in 2 x 2 smaller cells for a better approximation but that would yield a larger table. 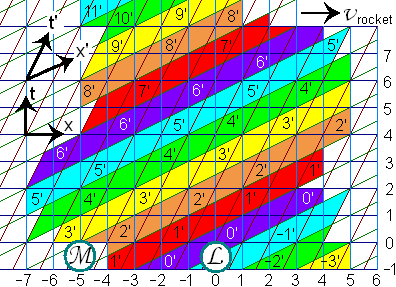 The part of the Minkowski diagram they transformed to a number-scheme concerns a length of 7 rocket colors on 5 subsequent moments in the lab-frame. Fig.3 The Minkowski diagram in the laboratory frame can be considered to consist of cells. In the rocket they have a similar time experience. The rocket passengers also experience one rocket-moment of their system of rods and clocks at the time and then that rocket moment passes to the next rocket moment. In the cockpit the captain had just asked the operator if the laboratory had already sent their new spacetime status. “Yes captain!” the operator said. He had just got transmitted the domino scheme as showed above and gave it to the captain who gave it a close watch. The captain lifted his eyebrows. “This is what they told us, sir”, the operator said. “This is how they see us, they say”. “But we don’t see us like that, don’t we?” asked the captain. “No sir” the operator replied. And Karl did see it. He had been the first to perform a Lorentz transformation on laboratory spacetime coordinates. The table Karl constructed consists of the same domino stones as the laboratory table. You can reorder domino stones in a spacetime table but you can’t separate the numbers of one domino stone. The last table showed rows of equal rocket time. The rocket is standing still now, it’s the earth that is moving. The velocity of the earth is represented by the inclination of the line of L’s in the table. For the table to meet rocket Minkowski spacetime (lightrays always at 45 degrees angle) the inclination rate of the line of L’s should be equal to the inclination rate of the t’ rocket time axis in the laboratory Minkowski diagram (fig.3). The empty cells in the table are no gaps. It only meant the scheme had been represented better when spacetime measurements were given by a factor 2 more accurate. Then the gaps would have been filled with the intermediate measurements. The leaning line of equal laboratory times betrays the dissynchronization of the laboratory times in the rocket frame. 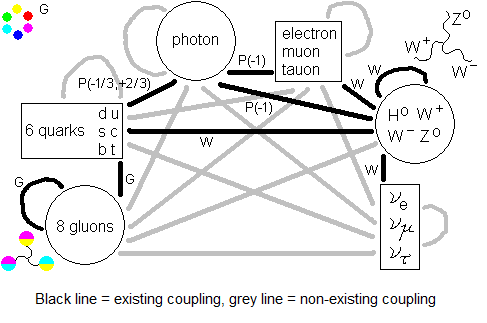 The inclination of the line of equal laboratory times should be equal to that of a rocket band of one color in the laboratory Minkowski diagram (by example a yellow band). Two frames that are moving relative to each other see each other dissynchronized. They also see all each others lengths contracted along the direction of motion. They see each others clocks running slower - also timedilation is symmetric between frames in motion relative to each other. When relative velocity slows down to zero then original sizes are restored. The other frame regains its normal lengths, clocks are no longer dissynchronized and all run at the same pace again. That is, time itself is running everywhere at the same pace again. All phenomenons characteristic for sr disappear except for one. In the frame that has undergone acceleration the amount of timedilation build up so far, becomes real. Acceleration realizes timedilation. Gravity is not distinguishable from acceleration and therefore also gravity realizes timedilation. But that is gr, general relativity. You are in the laboratory, L or M or whatever. What do you see when looking at the nearly-lightspeed rocket that was introduced at page 2 of this storyline? Actually this is seen by no frame and no kind of direct vision. This is already more realistic. 1) The rocket length has contracted. There are more windows per laboratory-meter now while the height hasn’t altered. The round windows have become ovals. 2) Time runs slower, therefore there are lesser photons emitted per laboratory-second, which dims the light. Because there are more windows per laboratory-meter the light-yield per laboratory-meter is larger, which brightens the light. These two effects happen to cancel each other since the factors of lengthcontraction and timedilation are each others reciprocal. The luminosity is unaffected. 3) Photons are emitted slower and therefore have longer wavelength. The colors have become red-shifted. That is, when measuring photons that are emitted perpendicular to the rocket’s velocity. 4) Timedissynchronisation effectuates itself in lengthcontraction. Measuring photons perpendicular to the rocket’s velocity offer no lengthcontraction contribution, no timedissynchronisation effects. Timedilation has its full reign. When shifting towards the rocket’s ends the measuring direction becomes more and more aligned with the rocket’s velocity and lengthcontraction gains strength. When fully aligned the timedilation and lengthcontraction effects cancel each other completely, leaving only classical Doppler-effects to the arriving lightrays. Light from windows further away is more aligned with the rocket’s velocity and becomes less timedilated (up to zero) and more classical Doppler-shifted (up to full classical). 5) When rocket velocity approaches lightspeed too much, then red-shift by timedilation alone might already have shifted the colors out of sight into or even below the infrared region. Frame observation then measures no visible photons perpendicular to the rocket’s velocity. We assume the original rocket colors are one-wavelength only: just the colors, nothing else. 6) Doppler-effect to the light of the receding part of the rocket red-shifts the light still more. Frame observation then offers no visible photons from the receding part of the rocket. 7) Doppler-effect of light from the approaching part of the rocket blue-shifts the light. When shifting your measuring direction from perpendicular to the rocket’s velocity to more and more aligning with it, the blue-shift begins to diminish the of timedilational redshift, finally cancels it (where a visible part of the rocket appears) and then begins to blue-shift the light until it finally entered the ultra-violet region, where it once again is invisible to the human eye. Frame observation at the approaching end of the rocket offers a limited rocket section where visible photons are emitted. You stand on the earth and just look up to the sky. When you look in the direction of shortest distance to the rocket you have the best view. The rocket’s velocity is nearly perpendicular to the line of sight. 8) The main difference then with frame observation is the time delay for the light to travel to your eyes - about 1.5 earthly seconds for the shortest distance to a rocket speeding by just outside the orbit of the moon. In this direction the delay is almost the same for neighbouring windows, so you hardly notice any difference with frame observation. You see sr’s effects with your own eyes. Except when the rocket’s velocity is too high. Timedilational redshift can make you see nothing in the direction of shortest distance. 9) When the line of sight shifts towards the direction of the rocket’s ends where they are loosing themselves in the distance, you look more and more along the line of the rocket’s velocity. Classical Doppler-effect might yield invisible rocket ends. But there might be a visible section somewhere on the approaching rocket part. Light from further away on the approaching rocket part, behind the visible part, is blue-shifted to the UV region or eventually beyond. The luminosity doesn’t diminish by any sr effect. The luminosity does increase by classical Doppler-effect. You eventually might be X-rayed. What you actually see is difficult to judge by arguments alone. One needs calculation. Or experiment.